Israeli Prime Minister Benjamin Netanyahu voiced his fierce opposition to Iran’s nuclear program in front of a joint session of Congress Tuesday, a speech in which he said the world’s greatest danger is the meeting of militant Islam with nuclear weapons. Upon introduction, Netanyahu was greeted to deafening applause in US House chamber, an ovation that crescendoed when the prime minister took the podium. “I know my speech has been the subject of much controversy,” he said, adding that it was “never my intention” to be political. The prime minister was invited by Republican lawmakers who bypassed the White House and State Department, ruffling more than a few political feathers in the US capital. Based largely on the break in protocol for a head-of-state visit, US President Barack Obama has refused to meet the Israeli PM during his visit, while Vice President Joe Biden and Secretary of State John Kerry are both abroad. At least 55 congressional Democrats said they would boycott Netanyahu’s speech, according to the Hill, again showing political fractures in Washington. The Israeli prime minister has said he believed the “two-party leadership” of Congress had invited him, but congressional aides said they knew of no congressional Democrats who had been consulted, according to Reuters. Netanyahu thanked Republicans and Democrats for their “common support for Israel, year after year, decade after decade,” including aid for Israel's Iron Dome missile defense system. Netanyahu said he appreciated all that "President Obama has done for Israel," including financial backing of the Iron Dome program and opposing "anti-Israel UN resolution." Netanyahu continued to speak out -- in the most bellicose of terms -- against ongoing negotiations between Iran, the United States, and other world powers regarding Tehran’s nuclear program, which is legal under the terms of the Nuclear Non-Proliferation Treaty, to which Israel is one of the few United Nations members that is not a signatory. On Tuesday, Netanyahu called Iran “the foremost sponsor of terrorism” that threatens not only the Israel and the Middle East, but the world, including the US. We must “stop Iran’s march of conquest subjugation and terror,” Netanyahu said. He charged that Iran controls Middle East capitals of Baghdad, Sanaa, Beirut, and Damascus. The prime minister warned that the rise of ISIS, or Islamic State, and a nuclear Iran foreshadowed grave results in the Middle East and beyond. "The battle between Iran and ISIS doesn't turn Iran into a friend of America. Iran and ISIS are competing for the crown of militant Islam," he said. "In this deadly game of thrones, there's no place for America or for Israel, no peace for Christians, Jews or Muslims who don't share the Islamist medieval creed, no rights for women, no freedom for anyone." He said a deal over a nuclear Iran could mean the proliferation of weapons with the full legitimacy of world powers. He finished with a note of solidarity between the US and Israel. As The Intercept reported Monday, Netanyahu has repeatedly sounded the alarm over Iran's supposed impending nuclear weaponry for the last two decades. One of those instances came during a speech during a joint session of the US Congress in 1996. “If Iran were to acquire nuclear weapons, this could presage catastrophic consequences, not only for my country, and not only for the Middle East, but for all mankind,” Netanyahu said. “The deadline for attaining this goal is getting extremely close,” he added. In response to the speech, a senior Obama administration official said Netanyahu failed to offer any real alternative to current negotiations with Tehran. "Simply demanding that Iran completely capitulate is not a plan, nor would any country support us in that position. The prime minister offered no concrete action plan," the official said, according to Reuters. US President Barack Obama said on Monday that a deal is still possible. While Iran is still "more likely than not” to reject a deal, the odds of success are better today than three or five months ago, Obama told Reuters. On Monday, Netanyahu appeared in Washington before his controversial speech to Congress and just weeks before his reelection to speak to the kingpin of the Israeli lobby in the US, the American Israel Public Affairs Committee (AIPAC). 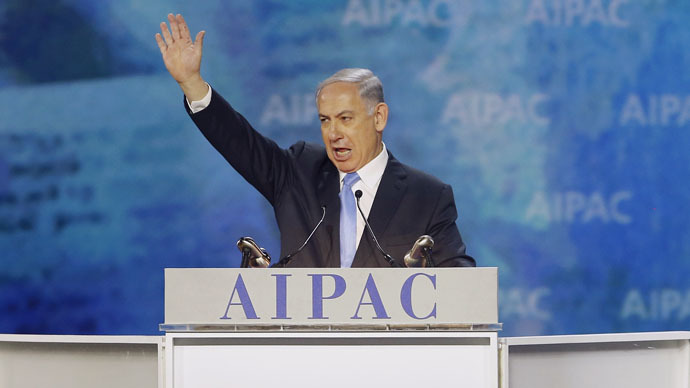 Speaking before AIPAC on Monday, Netanyahu briefly touched on the subject of Iran, calling it “the foremost state sponsor of terrorism in the world,” adding there must be no way Iran achieves a nuclear weapon. Netanyahu said on Monday that in his speech before Congress, he would not attack US President Obama, a man the prime minister said he had much respect for, as well as the office of the US president. “Both Democratic and Republican presidents have worked together” to support Israel, in providing vital defense funding and prime trade opportunities, he said. Netanyahu also brushed off any criticism of the congressional address as he thanked both Democratic and Republican members of Congress for their consistent support of Israel. For Iran, the nuclear negotiations also represent a way to shake harsh economic sanctions levied against it by the West, mainly the United States. Iranian Foreign Minister Mohammad Javad Zarif said Tehran’s aim with the negotiations has been to ensure its nuclear capabilities remain for peaceful ends and that sanctions are eased, Reuters reported Tuesday. "Our negotiating partners, particularly the Western countries and particularly the United States, must once and for all come to the understanding that sanctions and agreement don't go together," he said from Geneva. "If they want an agreement, sanctions must go... We believe all sanctions must be lifted." US Sec. of State Kerry has warned against public discussion of the ongoing nuclear talks between the US and Iran as part of the P5+1 negotiating group, as this might damage the process aimed at preventing Tehran from developing nuclear weapons, AP reported. "We are concerned by reports that suggest selected details of the ongoing negotiations will be discussed publicly in the coming days,” Kerry said from Geneva on Monday. “We are insisting…that sanctions can snap back into place if Iran were to violate the agreement,” a US official told AFP last week.